Each of Simon’s marketed tricks comes complete with all the necessary gaffed cards. You display both sides of a small printed Instruction card for the "world's greatest card trick" which was received in today's mail. You offer to try it out with the spectator's help. As you read off each instruction, the spectator performs each step. The instructions guide the spectator to select a playing card from a shuffled deck, sign its face, replace it in the deck, and finally bind the deck up in rubber bands, just to make it magician-proof. The signed selection remains in full sight at all times, until it is visibly buried in the deck. The spectator herself binds the deck with rubber bands and drops the deck into your jacket pocket. The final instruction is then read, but it says merely "magically produce the card." Undaunted, you make a magical gesture over the Instruction card itself which you've been holding in full view since the outset. The Instruction card is then turned around to reveal that its other side has magically changed to the spectator's actual selection, complete with the spectator's own signature! The Instruction card is immediately given to the spectator to keep as a souvenir. It's an impossible object which she'll keep forever- her personalized memento of the time she witnessed the "world's greatest card trick." To download a FREE MOVIE CLIP of Simon performing Side-Swiped (Windows Media Player required) click here. Two of Simon’s newest routines, from Try the Impossible. O’Aronson Aces is an Ace Assembly, presented as a lesson in card cheating – but with a surprise "O’Henry" ending when all four Aces assemble under the spectator’s own hand! 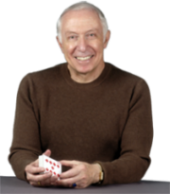 Nosnora Aces relates a magician’s "dream": the performer illustrates his dream of performing a perfect Ace Assembly, but of course, at the climax he admits he "woke up" – and it was all just a dream, as the Aces instantly revert back to their original packets! In both routines, the Aces are seen to arrive one at a time in the leader packet, with no palming and no extra cards! Just some special gaffs combined with some of the most subtle handling you’ve ever seen, to create effects that look like real magic. Gaffed Cards Only (for both routines): for those who already have Try the Impossible. Only $10.00. the Ultimate Thought-of Card Across! 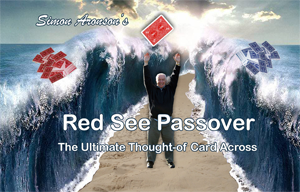 "Red See Passover is one of the five strongest card tricks you can do, for anyone." Two spectators, Ginny and Dave, are asked to help with an experiment involving two decks of cards, one red-backed and one blue. Both decks are shuffled, and each spectator takes one. The spectators themselves each deal 12 cards face down from their respective decks. The rest of the cards are placed aside. No extra or additional cards are used. The red cards are openly and deliberately fanned so that Ginny can see all of the faces, and she is asked to merely think of one card. The fan is closed and tabled, and Ginny places her hand on top of this red packet. The packet of blue cards is then spread once more to show it only contains blue-backed cards, and Dave places his hand on this blue packet. Ginny concentrates on her mental selection. She then removes her hand from the red pile and she counts her cards face down – there are now only 11! Dave likewise counts the cards in his blue pile. He finds that there are now 13 and one of them has a red back! The 11 red cards are then turned face up and all are fanned in front of Ginny. She is asked whether her mental selection is still there, and she finds it has vanished. Finally, the red card in the middle of the blue packet is removed and shown to be Ginny’s mental selection. the Spectator Stab that fooled Dai Vernon! Two cards are freely selected, replaced and then lost in a shuffled deck. The deck is ribbon spread face down across the table, and a spectator takes an advertising card and freely inserts it into the spread, wherever she desires. The spread is then flipped face up – and the two cards on either side of the advertising card are seen to be the two selections! Originally published in the Hierophant, reprinted in Bound to Please, and a staple in Simon’s lectures. When this effect was first performed at the Magic Castle, the Professor returned again and again to view it, asking, "Where’s the move?" But it’s not sleight-of-hand – just subtlety plus two specially printed gaffed advertising cards, for a hands-off, stabbing miracle. Only $7.00.